Weasel words are words that somehow manage to weasel themselves into our writing, but are passive, weak words, and generally lazy writing. Most authors must learn to eliminate weasel words from their writing. It’s not as easy as it sounds, and many writers choose to do a search and replace once their book/article is finished. 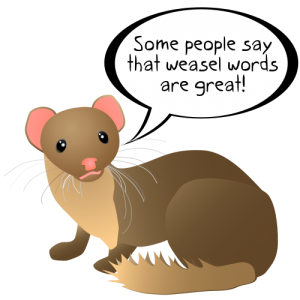 The following is a list of weasel words to eliminate from your writing. This list is not exhaustive, but you’ll get the point. • Vague “its.” It is a pronoun used to replace other things. • Putting backstory in the first 30 pages of a novel creates 30 pages of weasel words. Don’t do it. • Stating the obvious creates weasel words. RUE = resist the urge to explain. Our readers are not stupid. • Simultaneous action AKA “the –ing thing,” creates weasel words. “Closing the door, she walks away.” She can’t do both at the same time. Also be weary of italics. One writing professional told me italics are like roaches, too many are aggravating. However, in my humble opinion one roach is unacceptable and more are quite more than aggravating. Great list – definitely need to work on this in my writing. Thanks! Uh, oh. Or I should say Yay! I thought I was finished with a particular piece of writing, but now I know why it seems more than a little weaselly to me. My opening isn’t on the list, but it should be. Off to start another editing session. Great post! Thanks, good teaching; I never thought of it that way.